LumenARRT! seeks to promote social, political and environmental justice by projecting large images and messages on buildings and other structures. WATERVILLE — Geoffrey Leighton and his wife, Anita Clearfield, are passionate about social, political and environmental justice, and they raise awareness about it in a big way. They project large video images onto buildings and other surfaces outside at night, using sound and animation to create a visual voice for nonprofit organizations and other people whose voices otherwise might not be heard. For instance, to counter the idea that immigrants do not communicate with locals or contribute to the economy, Clearfield and Leighton went to Congress Square in Portland and projected onto a monument images of immigrants speaking about their experiences. They also projected a narrative about immigrants in general on the outside white wall of the public library and included statistics showing the contributions they make. “It was great, working with the immigrant community and many of the people in the square were touched by seeing the people,” Clearfield said. She and Leighton are part of LumenARRT!, a project of the Artists Rapid Response Team, which works through the Union of Maine Visual Artists to advocate for artists and progressive nonprofit organizations in the state. On Friday night, they projected images on City Hall at Castonguay Square in Waterville for hundreds of guests during the opening night reception of the Maine International Film Festival. The projections were about warming in the Gulf of Maine that endangers marine life, and about climate change in general. Spectators got to interact, live, by tweeting and drawing notes that were projected onto the outside of a white tent set up in the square. 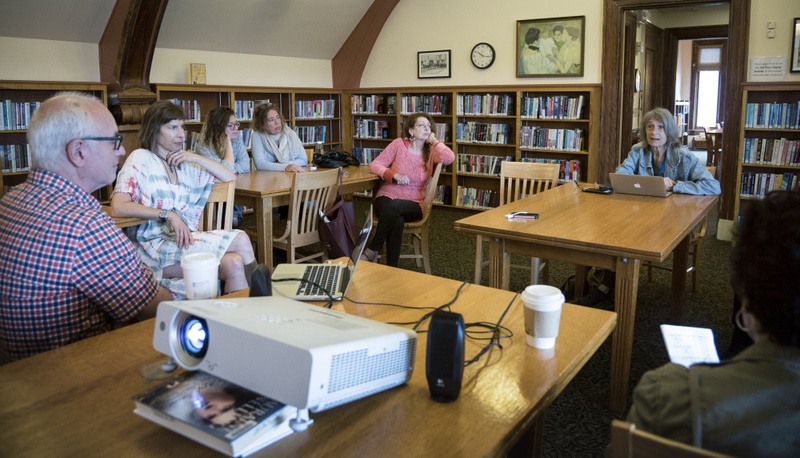 On Saturday, as part of the festival, Clearfield and Leighton hosted a two-hour workshop at the Waterville Public Library on how to create such video projections. 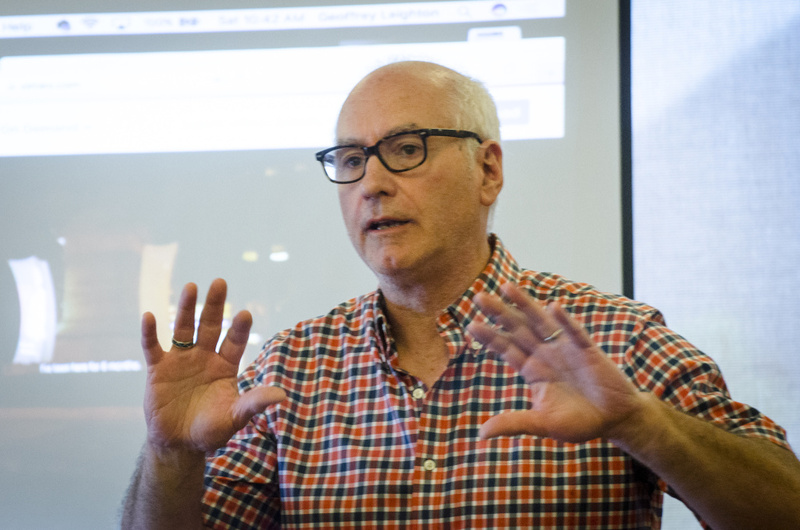 Participants at the interactive workshop were encouraged to launch their own video projection projects, with Leighton telling them they don’t need expensive equipment to do so. The most important component is the idea, he said. Start small, Clearfield advised. Borrow a projector from a school or university. He and Clearfield encouraged the dozen people who attended the workshop to contact them with questions or advice. The couple also welcomed them to join members of the ARRTeam, which meets once a month in Brunswick to make large banners for nonprofit organizations around the state that want to get a message out. People can obtain a schedule and other information about the meetings at the websites LumenARRT.org or ARRTeam.org. “We’d like to help you in very specific circumstances, and we can brainstorm to make it something you can work on,” Leighton said. 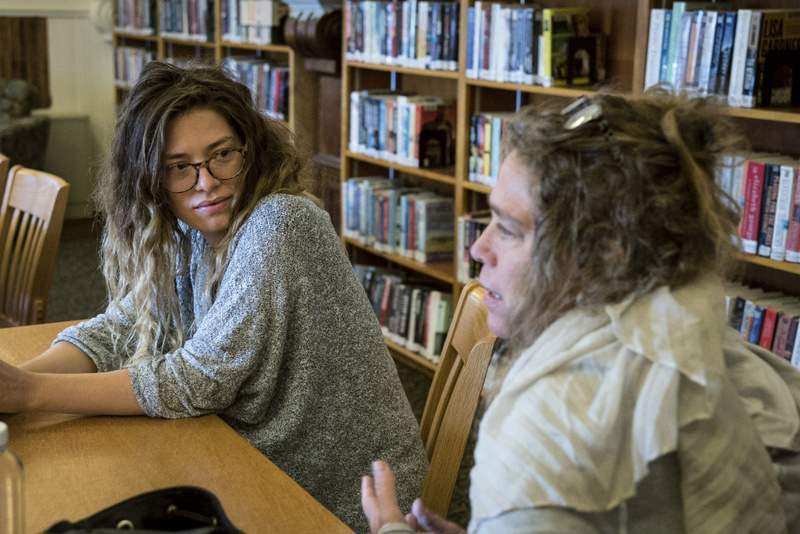 Workshop participants Saturday included a film teacher from Montreal, a filmmaker from Vermont and a former social worker and addiction counselor. Lana Smithner, 29, and her mother, Denise Rohdin, 55, sat together at a table Saturday, absorbing the information like sponges. When Clearfield and Leighton asked participants to introduce themselves, Smithner, an actor, world traveler and Bates College graduate, said she attended the workshop to explore how the process works and learn how she can use it to help people communicate what they want to say. Rohdin, a freelance art teacher who summers in Waterville and spends the winter in Florida, said she was interested in using projection video as a tool for social change and creating community conversations about issues such as incarceration rates. She also is interested in creating multi-generational activities, she said. “I love the fact that this is kind of like graffiti but it comes up and goes away,” she said. Both Smithner, who travels in winter and also summers in Maine, and Rohdin asked questions and commented during the workshop. When it was over, they said they learned a lot. Smithner, who is working in the projection room at Railroad Square during the 10-day film festival, told Clearfield and Leighton she was interested in shadowing LumenARRT for a day. They welcomed her to do so. Afterward, Smithner said she was eager to use the skills she had learned Saturday. Leighton, of Durham, has been working in video production about 40 years and owns a production company, Leighton Images. He has animation and production equipment that allows him and Clearfield to do a lot of animation and preparatory work for the projections, he said. Clearfield now has a show of video installations at the Maine Jewish Museum in Portland. Leighton said sometimes he feels as if children are seeing the world through small screens such as iPhones, iPads and laptops, and LumenARRT! can help them expand that view. “This is an opportunity to do something very large,” he said.